The Chinese Foo Dog\'s characteristics remain largely a mystery for this rarest of breeds. 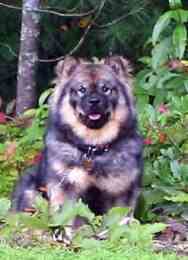 They resemble the typical Northern type dog, compact and square-like in profile. They have a moderately broad head with prick ears. Similar in structure to the Chow Chow, the Foo Dog\'s coat is substantial without being coarse. The tail is carried over their back, as it is slightly curled. Foo Dogs are medium sized dogs, bulky and used for working. They are one of the spitz-type breeds, originally used to pull sleds, herd, and to guard. They are bold, energetic and make an excellent watch dog and guardian dog. They learn quickly, and are very intelligent. They tend to be good with children as well. There are three types of Chinese Foo Dogs in height: toy, miniature and standard. The three divisions of standard in weight are: small, medium, and large. The standard are over 15 inches, the miniature 10 - 15 inches, and the toy are less than 10 inches tall. Chinese Foo Dogs were often kept to guard palaces, sacred places and homes. They were popular in China for a time, and are thought to possibly be the link between the Chinese wolf and the Chow Chow. Hardy, alert and a courageous, the Chinese Foo Dog is excellent for a family needing a loving, working companion. Chinese Foos are bold and energetic, alert and courageous. They are unafraid of strangers, and will defend their master\'s possessions. They are loving, hardy, strong and independent. They learn quickly, and love to guard and alert their owners of intruders. They are good with children and quite friendly. Chinese Foo Dogs are a dignified breed. The coat of the Chinese Shar-Pei is not very high maintenance, however it should be brushed to remove loose or dead hair occasionally. A rubber brush should suffice. The ears should be cleaned regularly as well as under the folds of skin. No significant health problems associated with this breed. If given proper exercise, this breed can do okay without a yard. An average sized yard is suggested, but is not required. This breed loves walks with his owner however due to the folds of skin, which can make him overheat, fresh water should always be provided. The Chinese Shar-Pei can be stubborn at times, making him somewhat hard to handle when it comes to training. However, he is very willing to please and is intelligent. Firm handling should be practiced with this breed.